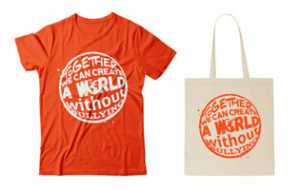 Together we can create a world without bullying! 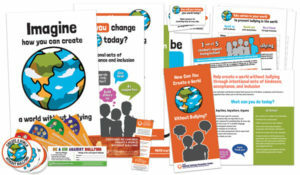 The event kit is designed so that anyone can set up a display (in the classroom, library, hallway or event) with print resources to educate and engage participants about steps each one of us can take to help prevent bullying. Each kit has materials for up to 50 participants. Kits are available for $50. Special offer: The 5-poster series from the kit can be ordered as a stand-alone resource for $10. These colorful, educational visuals are excellent reminders for students. The 5-poster series is available for $10. 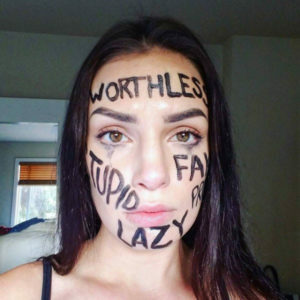 Make a statement to help prevent bullying! This one-of-a-kind shirt and tote are only available during September and October. 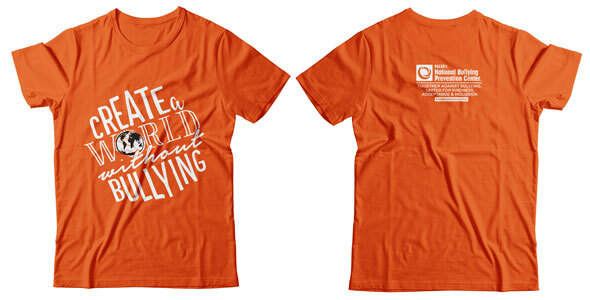 Order soon so that you can show your support by wearing orange, the signature color of bullying prevention, during National Bullying Prevention Month, on Unity Day, and all year long. Proceeds will benefit PACER’s National Bullying Prevention Center so that we can work with you to prevent bullying and promote kindness, inclusion, and acceptance in our schools, communities, and the world! Official CHOOSE KIND Shirt Available Now! WONDER, R.J. Palacio’s New York Times bestseller, is the incredibly inspiring story of Auggie Pullman, a boy with facial differences who enters fifth grade at a mainstream school for the first time. This heartwarming story was made into a movie and is in theaters now! The inspiring take-away message from reading the book or seeing the movie is to always CHOOSE KIND. You can show that kindness matters by purchasing the film’s official CHOOSE KIND T-shirt. Every shirt sold benefits PACER’s National Bullying Prevention Center. The Loukoumi Make A Difference Foundation and PACER’s National Bullying Prevention Center are calling on YOU to unite against bullying on National Make A Difference Day October 28. 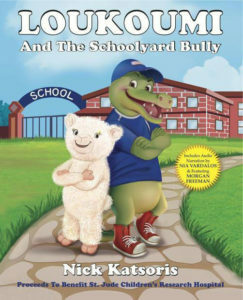 All you have to do is watch Loukoumi & The Schoolyard Bully and then take PACER’s Kid’s Against Bullying Pledge and then make a difference with Loukoumi and PACER and do a random act of kindness! Learn more about Loukoumi and share what you did to make a difference. PACER’s National Bullying Prevention Center has partnered with Disney’s #ChooseKindness campaign to reinforce the importance of being kind during October, which is National Bullying Prevention Month. Disney is producing original programming and customized public service announcements (PSAs) that are airing on multiple platforms across ABC, ABC-owned television stations, Freeform, Disney Channel, Disney XD, and Radio Disney. 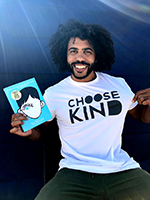 The “Choose Kindness” campaign is designed to inspire kids, families and change-makers around the country to put an end to bullying. In addition to PACER’s National Bullying Prevention Center and Unity Day, the campaign is collaborating with GLSEN’s “Ally Week,” GLAAD’s “Spirit Day,” and the Ad Council’s “I Am A Witness” campaign. For information, visit Disney Be Inspired and ABC Be Inspired. 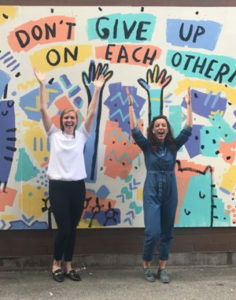 Instagram unveiled a colorful custom-designed #KindComments mural by renowned artist Dallas Clayton (@DallasClayton) on Oct. 5 at the TOMS store in Chicago’s Wicker Park. The mural opening celebrated Chicago community members of all ages who are making the world a kinder place. #KindComments is a global initiative to promote and foster positive engagement online. By transforming walls into colorful beacons of kindness, Instagram hopes to create positive spaces for people to gather in real life and encourage visitors to take a photo or video in front of the wall and share #KindComments on (and off) Instagram. Murals inspiring #KindComments will also be launched in New York, Dallas, Washington D.C., Mexico City, Jakarta, Tokyo, and Mumbai, among other cities. Download “Instagram Safety Tips” created by Instagram and PACER’s National Bullying Prevention Center. PACER’s National Bullying Prevention Center and Clarisonic® announce a new partnership and campaign designed to drive awareness and raise donations for PACER’s bullying prevention efforts. Clarisonic wants everyone to feel confident about the skin they’re in. Uncovering personal confidence and building it within others can help everyone resist bullying and spread positivity. For every #CleanTheMean social post shared on Facebook or Instagram this year, Clarisonic will donate $1 to PACER’s National Bullying Prevention Center, up to $100,000. Learn how sharing your post contributes to a kinder, more beautiful world. We were excited to be part of the #GiveALittleTLC awards on Sept. 27th, hosted by TLC in partnership with Redbook and PACER. This inspiring night honored individuals who are making the world a kinder, more accepting and inclusive place. Congratulations to everyone honored! 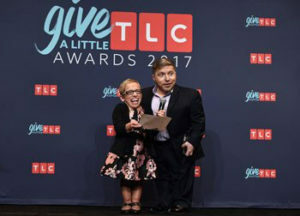 Learn more about TLC’s Give a Little campaign. Join Disney Junior and PACER’s National Bullying Prevention Center to explore and inspire what it means to choose kindness! Disney Junior is encouraging children to show kindness at home, school and within their community with this Kindness Kit available to download for parents and schools across the country. Disney Junior’s new series “Vampirina” tells the story of a young vampire girl who faces the joys and trials of being the new kid in town when her family moves from Transylvania to Pennsylvania. The series follows Vampirina (aka “Vee”) as she adjusts to life in the human world, including making friends and attending a new school. Along the way, Vee learns that it may be easier to blend in with her peers, but it’s more valuable to celebrate the qualities that make each individual unique. 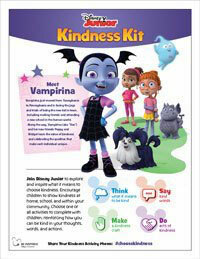 Download the Disney Junior Kindness Kit.